Recently someone told me, "If you knew MY parents, you'd understand why I don't honor them." This attitude is prevalent in our culture - even among Christians, whether they openly admit it or not. Whether we like it or not, our attitude toward our parents reflects our attitude toward God. 1. When we refuse to move past our family difficulties we doubt God's ability to use all things for good (Romans 8:28). 2. 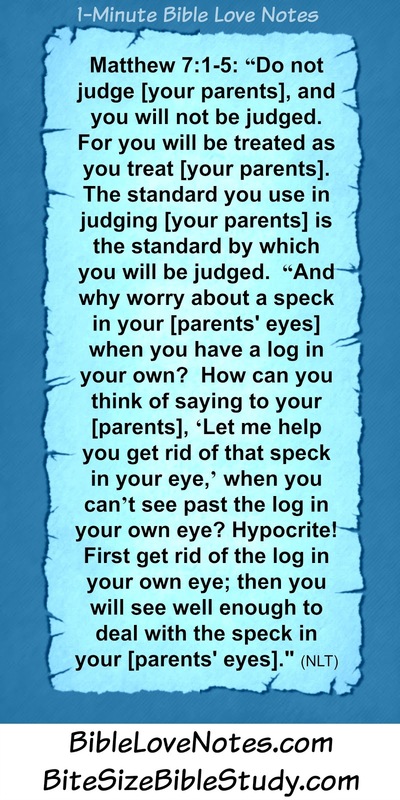 When we judge our parents harshly and judge ourselves leniently, we become hypocrites (Matthew 7:1-4). 3. When we refuse to forgive our parents, we become bitter (Ephesians 4:32). 4. When we ignore the command "Honor your father and mother" (Ephesians 6:2-3) we damage our well-being (Exodus 20:1-17). Even if you aren't neglecting, rejecting or resenting your parents, examine your heart and ask God if you're truly honoring them. *If your parents are truly abusive, God will give you safe ways to honor them. Would you like a 1-minute devotion like this delivered to your inbox each weekday? Sign up for a free subscription at BibleLoveNotes.com. Would you like a short Bible study to accompany the devotion each Monday? Sign up for a free subscription on the right side bar here. If you think your parents need to "earn" your respect, think again. 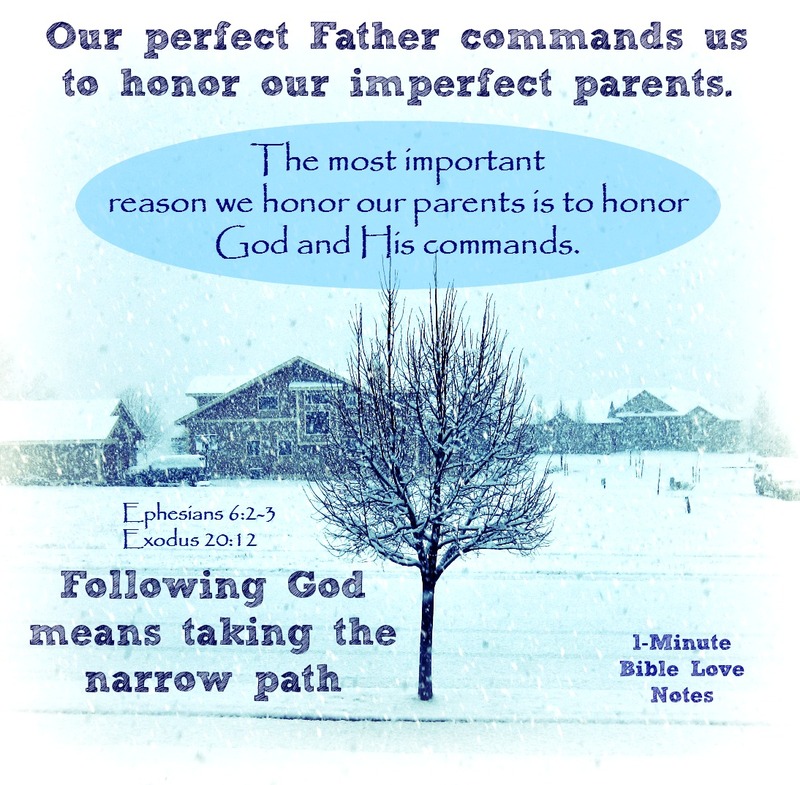 God puts no conditions on His command to honor parents. Some parents are especially evil and God will give you wisdom about honoring them in ways that do not harm you physically or emotionally. But most parents are doing the best they can. As we deal Biblically with our parents, we learn trust, grace, and forgiveness. Perhaps our greatest sin as adult children is harshly judging our parents while excusing our own disrespect, disregard, or bitterness. For better understanding of this passage, read "Do Not Judge"
1. Have you ever taken time to carefully examine your actions and attitudes toward your parents, both when you were living in their home and as an adult? 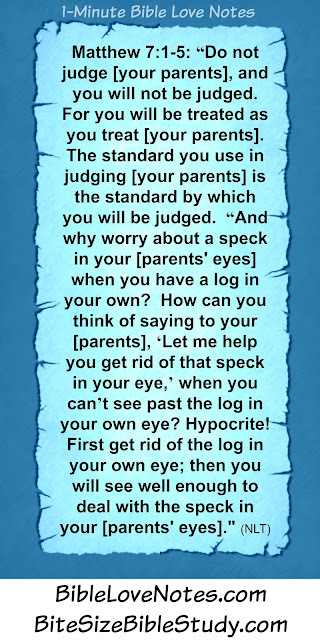 This is the only way to remove the plank from your eye so you can see your parent's sins in perspective. Many adult children focus on their parents' mistakes without ever examining their own. When you were young: Were you an obedient child, grateful, respectful, helpful? Since you've been an adult, have you been respectful, grateful, helpful, and considerate? Most adults have great difficulty seeing their faults and great ease seeing their parents. 2. Have you ever confessed and asked forgiveness of your parents for ways you treated them as a child? How often have you asked their forgiveness as an adult? This is a necessary part of taking the plank out of your eye. In the original Hebrew language, the word for honor meant "heavy" or "weight." ... "I weigh you down with respect and prestige. I place upon you great worth and value." God uses our relationship with our parents to teach us about our relationship with Him: Hebrews 12:7-10; Luke 11:11-13; 1 John 3:1; Hebrews 12:14-15). Our perfect Father commands us to honor our imperfect parents, not because they necessarily deserve honor but because He does! Please read We Can Be Victims or Victors if your parents are especially difficult. God was just speaking some of this to me this morning. He is helping me let go of their weaknesses and helping me to grow up, not that he is saying this in a scolding way but in a way that says, "you can and are doing it and I am proud of you." 43 year old mom of 4. That blesses me to hear. In the same way, God spoke these truths to me. May He continue to guide you in your relationship with your parents. For a long time I thought honouring my parents meant I had to say nothing to my mother about her manipulation, abuse and disrespect of me. Now I realise that the only Godly way to honour her is to never see her again. This is for a few reasons: first, she wanted to be the highest place is my life, higher than my husband (wrong bc of Genesis 1) and even higher than God although she would deny this (wrong because of weĺl, the whole Bible esp the 1st commandment but Matthew 10:37 really helped me here). Second, she was continuously so abusive to me, my husband and my siblings (in the process breaking Ephesians 6:4) that there was clearly no repentance. Despite multipe warnings that her behaviour was destroying our relationship she continued on. Being human and not divine, I was finding it very hard to live in an honouring way with her, as well, letting her think she was more important than God in my life is not honour; it is enabling. So now I am not in contact with her and I can heal, repair the damage she did to my relationship with God by her lies both verbal and non verbal, and gradually work towards a deeper honouring and forgiveness of her as I think through her humanity and reflect on how much God loves her and me. Its not my job to fix her, despite years of thinking so. Only God can save her, but I can pray.It's not that I think I'm perfect and am being childish about normal human weaknesses. It's that God finally rescued me from a place of slavery to idols, and is helping me become the woman I'm meant to be in Him. I asked God one day, "How do you honor a father who walks out on you?" His showed a women in the church choir my pain and she came over and let me know that He heard me and that I honor him by forgiving him. Doing genealogy, I have learned that my dad couldn't love me the way he should have because he was never shown or taught how to. My mom has had to love us kids for the both of them. I have since gone to see my father (after not seeing him for 26 years) and I told him that I forgave him.